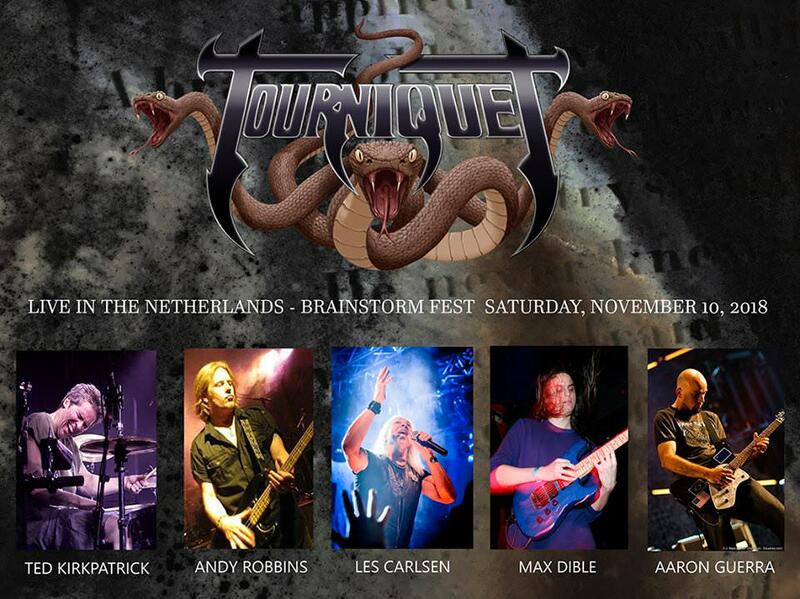 Tourniquet announced a new live show to happen on November 10th in Netherlands, Europe. It's been about 10 years since they've last been in Europe, and this kind of a 25th anniversary of the Intense Live Series album where Les Carlsen did the vocals. I guess this shows Ripper Owens will only appear on the album unless he'll do some US shows, but I really doubt that. Which would imply they still have zero idea who their next official singer will be. Along with Ted, Aaron and Les there will be Andy Robbins on bass (like in their last live show) and Max Dible on second guitar. Let's hope they've learned from the passport problems they had in their last show and couldn't get the second guitarist taken along. I really hope we FINALLY can hear a two-guitar performance. And as I can't go to that show I hope someone will record it. What comes to Les Carlsen, he's a phenomenal vocalist but I thought he was a bit of a hit and miss in the Intense Live album. Fits very well on some songs but not on some others. However, I'd really love to hear him on Gazing at Medusa. Deen Castronovo has great rasp in his voice and it really made wonders with that track. Les has even raspier voice so I can already imagine Les will sound amazing on that song. No way Ripper will do shows with them IMHO. He expects to be paid. I'm sure he got paid to sing on this album. Wow, what a stellar line-up. With Andy Robbins and Les Carlsen, it's like three for the price of one. I wish they could come to Brazil one day. Regarding Ripper, I am not sure if would be that expensive to bring him to some live concerts. He did some small concerts here in Brazil last year and our currency wouldn't allow a fancy payment. And I am assuming that they will all be paid, as well. I think things are going allright with Ted what comes to money. He currently has all the rights to every single Tourniquet release and things like Spotify are good for him since there's no record company to take their cuts. He gets all the possible ad revenue that comes from any Tourniquet video on Youtube also. This makes me wonder if he gives any royalties to the past band members who have written some lyrics and music for Tourniquet. things like Spotify are good for him since there's no record company to take their cuts. His cut from Spotify is probably 5 dollars a year. They are notorious for paying fractions of a penny. What I meant above is that Ripper demands to be paid more than he's paying this current band. He's a name vocalist who was in Judas Priest. I didn't even know who Les was, that's how much of an impression he's made outside of this tiny insulated Christian metal genre. Ripper was a gun for hire, he's busy doing other stuff. This line up could be interesting but it will sound like Bloodgood with TQT doing the music. I saw in some recent interview on Youtube that he bought the rights of every album Tourniquet has released through labels and now he own it all. I agree with ToB, Spotify may not be very profitable, but he also gets the profit of every digital sale, he can put all the songs freely on Youtube if he wishes so, he can make voiceless versions of Tourniquet songs, as he did with Antisept Bloodbath, etc. I liked Les on the Intense live album. Especially on "The Messiah" track. Yes, I know what people have said about Spotify for years and years. However, this is a band that has been around from 1990 and they are known internationally. The band has recorded way over hundred songs plus all live releases plus all Ted's own solo releases. Every tenth or a hundreth of a penny that Spotify gives from a listen after taking their own cut goes straight to Ted's pocket. He owns every single song they have and he has released. Usually when people complain about streaming services not paying much they also mention cuts to the band members and how much goes to the record label. I'm not saying he gets money from Spotify alone but specifically said "things like Spotify", meaning that he probably has put their songs in every possible and profitable streaming service along with Spotify. And adding Youtube to that where he probably gets ad revenue from every Tourniquet video there is, not just from the videos in the Tourniquet channel but from the videos uploaded by others too. It's not that he's filthy rich because that but surely this combination gives him quite a leverage compared to bands that haven't made as many songs and haven't been around for that long and haven't got all the rights to every song they've made. "Luke and Aaron have other employment where they live in California. I live in Wisconsin and the band is pretty much a full time deal for me." So it seems that at least at some point he was able to get by with whatever profits he got from the band. I'm not sure if that number is supposed to mean the amount of individual listeners who listen to at least one song each or the amount of listened songs overall, but if Spotify would pay Ted around $0,008 per song streamed he would get around $80 per month at minimum. It's not much but way more than $5 per year and when you add all the other streaming services it probably still isn't much but clearly not a totally worthless source of income. If that monthly number is individual listeners and not the amount of streamed songs then Ted obviously gets more than that. None of the services pay much but with 5 or 10 services the amount only adds up especially when all the money from every single song goes directly to Ted. On a different note, since it was mentioned that Ted has control of the entire TQT catalog, does anybody know if Collected Works is going to be reissued? I know once upon a time it was mentioned (by Ted I think) to issue a new version of it with the original tracks plus a second disc of material released since the original was issued. The original disc is hard to come by, and I wouldn't mind a fresh copy of the CD. That's impressive that Ted can live off his music. Kudos to him. Having said that, I seriously doubt RO will do any shows with Tourniquet. Look at all the other albums he's recorded vocals on that he performed no shows to support. Yeah, while I wouldn't think it's 100% impossible to happen (him being on stage in at least one show) I doubt it very much too. Honestly the biggest thing I hope is they would rehearse their shows well no matter who is singing or playing there. Some of the performances have been pretty sloppy compared to how tight they sounded in past (the last show in Netherlands with Tim Gaines on bass didn't sound that great and just one guitar on stage didn't help the situation at all). Airola wrote: Honestly the biggest thing I hope is they would rehearse their shows well no matter who is singing or playing there. Lately I am becoming more and more of the opinion that these virtual bands scattered across the world and these super-groups are just no good. Better to find a reasonably talented group of local guys, rehearse the crap out of some songs, and try them out in front of a live audience dozens of times before you record. I don't care how good the musicians are, these swapping files through email to create art just doesn't work. I think by now the results are in. I just could never get into Les Carlson's voice so I'm not keen on this. ToB, i did not say that he can live off music. He actually has a career as accounting manager or something similar, which allowed him to buy the rights of Tourniquet albums. Buy I am not sure even if he could get the money invested back. But I guess the income is not so insignificant. And maybe he could explore it a little better if he wishes so. I´m propably going to the show. It´s going to cost me tons to fly over there from Funland and get the accomodation and stuff. But I´m propably going to pay it to see T at least once in my life and to see one of my most fav. bassists (Andy Robbins) live. T hasn´t inspired me musically since Pathogenic, but there are some tunes I hope them to play to keep it worth. Many of us are hoping our favourite bands of the past to be active and to tour, but too few of us are ready to support them if they do so. That is sad and tells all of the way the business is going. I have one week of my vacation left, so I´ll spend some days of it being a tourist in central Europe. I´m not sure how Les is handling the gig, but being a fan of Bloodgood I´ll support him anyway. And the band, even thouhg it is a "foreign legion" in many ways nowadays. Ditto, except for the "I love les carlsen" part. I was hoping to never speak nor hear of this album again, except for The Tempter. The Messiah was bearable, but I'm not a fan of his overly dramatic vocal style. Wigeon wrote: Ditto, except for the "I love les carlsen" part. I was hoping to never speak nor hear of this album again, except for The Tempter. The Messiah was bearable, but I'm not a fan of his overly dramatic vocal style. I can totally understand why you would say that about his vocals. I love Bloodgood and I think his voice fits well with them...admittedly, there is a lot of sentimentality in there. To my mind, Les Carlsen is extremely talented and he was my favorite singer for a looong time. But it's opinion, and I can understand he is one of love or hate kind of singer. On the other hand, I can't say that he ruined Tourniquet Intense Live Series. What I can say about that is: The style of these songs were not written for his kind of voice. Honestly, I never thought Luke Easter could sing most of Guy Ritter's part on Early Tourniquet songs. Ark of Suffering is a good example. Another good point of view is: Could Guy Ritter sing Bloodgood? Doubtful. But it is also not a parameter to say that he is not a good singer. I know, many will say that some vocalists are versatile and could sing an array os music styles. But that is not always true. It's like if you take Michael Sweet to sing Mortification, It won't work, unless you change the song completely, maybe. But in the end of the day, who is the best Singer? Michael Sweet or Steve Rowe? Maybe we could have Ken Tamplin to sing these early Tourniquet songs. That guy can sing like anyone. How can you have a Brainstorm Festival w/out Brainstorm?! Les Carlsen singing 'Broken Chromosomes'? I'll pass. Sorry. Every time I've heard Les's name or a reference to that live album in the past 25 years, in my mind I hear the way he sang the words "Phantom Limb" like he was reading a book to a bunch of 4 year olds. That will still haunt me until the day I die.